Paul Scholes – devilish orange hair, short yet deceivingly strong, and a man who transcends Manchester United leaves us this past year as he heads towards retirement. Although nearly a year ago, Scholes did just the same before his abrupt announcement to return to his playing days, this seems like his second, and final retirement. As David Moyes stated a few months back, Paul Scholes was offered a position on his management staff which he subsequently turned down, and understandably so. After 499 league appearances culminating in a 5-5 draw against West Bromwich Albion last season, it’s time for the Englishman to finally rest those legs of his. About two decades ago, in 1993, Paul Scholes embarked on a journey to greatness – 11 Premier League crowns and few others to add to that during his time as a red. A career that transcended time only to be outdone by the current footballing freak, Ryan Giggs. Scholesy’s unique passing ability and his knack for scoring goals from distance brought many a smiles to the Old Trafford faithful. One of the true footballers whom was able to dictate matters in the middle of the park, he’s been noted worldwide as the best midfielder of all time, by Xavi, Iniesta, Pep Guardiola, and Zinedine Zidane to name a few. Zidane holds Scholes in such high regard indicating: “Paul Scholes is the complete midfielder. He is undoubtedly the best midfielder of his generation.” An intelligent and classic operator of the midfield, I for one, will miss those cracking strikes from 25-30 yards from goal. Paul Scholes has always been the quiet of the bunch at Manchester United – even sporting a bashful smile as Sir Alex Ferguson wished Scholes well in retirement almost seeming as if he would rather fade into the background of Old Trafford. In the midfield, Scholes was committed to his duties and did them with the utmost respect to the world of football, and Manchester United. He may not have been the fastest but he had the biggest heart. With a trophy-laden career under one of the most legendary managers of this past lifetime in Sir Alex Ferguson, he did have an achilles heel – his tackling. Known readily for rash challenges and brutally late studs up tackles early on in his career, set a precedent for a very card-prone career. Sporting 99 yellow cards in the Premier League, Arsene Wenger first hand noted the darker side to Scholes. Although Scholes may not have challenged rashly on purpose, the no nonsense midfielder made his bread and butter instilling fear in young attackers while also cutting the defense with inch perfect precision. 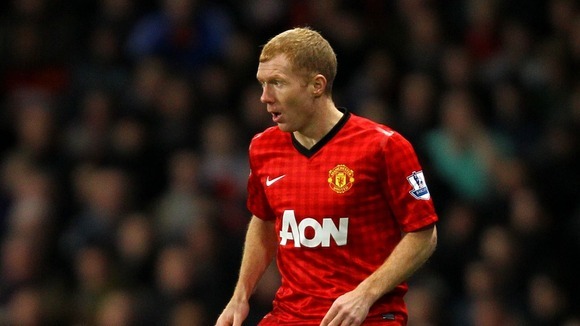 Paul Scholes, our ginger prince.